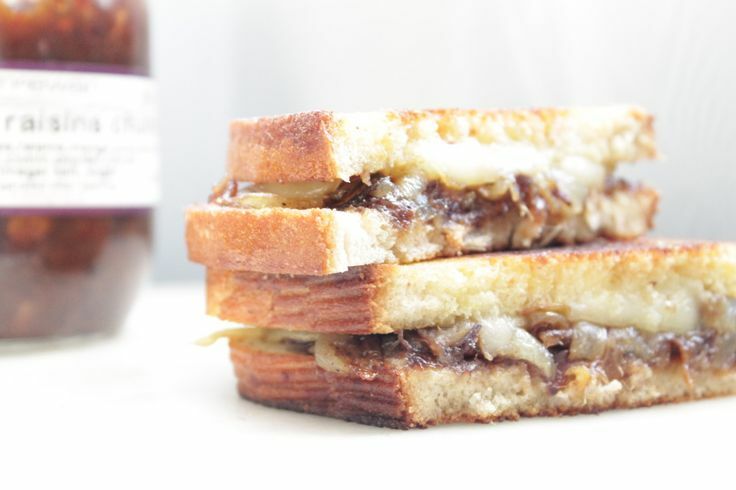 Embrace the rainy days with this simple and comforting caramelized onion and date chutney grilled cheese sandwich. Cheesy and flavourful, it is fancy enough for a weekend dinner or cut into smaller squares for a party appetizer! Heat olive oil on medium low heat in a heavy bottom skillet. Sauté onions slowly for 25 minutes stirring occasionally. After about 10 minutes add the black pepper. Once you have reached the 25 minute mark, stir in the small amount of brown sugar and remove from heat. Season with sea salt and pepper. Butter the outside of the bread. Top each slice of bread with a heaping teaspoon of McEwan’s Own Date and Raisin Chutney, aged white cheddar and the caramelized onions. Press together both pieces and cook in a heavy cast iron or heavy bottom pan for 5 minutes a side or until golden brown.